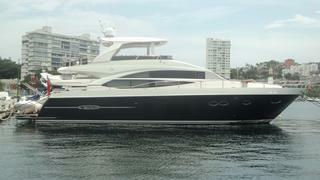 PICHOS III is a 2015 model motor yacht built by Princess Yachts. PICHOS III can accommodate up to nine guests in four beautifully decorated cabins; including one full-beam master stateroom with shower, one VIP cabin located forward, and two guest staterooms. The starboard stateroom has an extra Pullman bed for additional accommodation. PICHOS III is contemporary with upgraded interior wood floors. Her aesthetic is inspired by European styling, which creates a luxurious ambience in her interior. PICHOS III exterior has a stunning blue hull, giving her a touch of elegance. PICHOS III is a sport cruiser ready to take you anywhere you want. She is ready for her next adventure and is located in Acapulco, Mexico.